A Stellar sea lion drowned Monday at Bonneville Dam after getting tangled between two traps in what state wildlife officials are calling a freak accident. 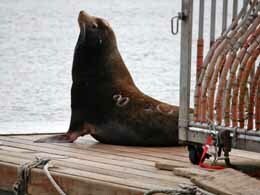 It's the second time in a week that one of the dam's cage-like wildlife traps has killed a sea lion. Sometime between Tuesday night and Wednesday morning last week, two California sea lions were crushed under a much larger Stellar sea lion after a malfunctioning door locked them in a trap overnight. According to a release from the Oregon Department of Fish and Wildlife, biologists think the sea lion that drowned Monday emerged from the water onto a narrow area between two cages, where the wooden floors of each come together to form a flat surface. When the animal tried to leave the narrow platform, biologists believe, it got tangled in the cables that hold the traps together. The sea lion flipped over into the water but remained tangled in the cables, causing it to drown. ODFW spokesman Rick Hargrave said in a statement the death is "unfortunate." "Our focus now is to prevent this from happening again," he said. The state fish and wildlife department operates four traps at the dam as part of a program to deter sea lions from preying on endangered salmon and steelhead whose upriver spawning trips hit a snag at the hydroelectric obstacles. During the height of the spring Chinook runs, which are happening now, hordes of sea lions congregate at the dam in search of an easy meal. Trapping at the dams had just resumed after a days-long pause following the deaths last week. Trapping at Bonneville is again on hold in light of Monday's death, with cage doors locked shut and a temporary barricade installed to keep sea lions from getting onto the platform between traps.